Populus spp. is particularly characterized by fast growth rates and by the potential to adapt to a very wide range of environmental gradients. The vigorous growth performance of Populus can be partly explained by high photosynthetic carbon uptake, efficient leaf area development, production of sylleptic branches, appropriate seasonal coordination of growth through phenological adaptations and regulation by phytohormones. However, the high productivity is inextricably related to high water use which may have serious implications for the economic viability of irrigated Populus plantations. 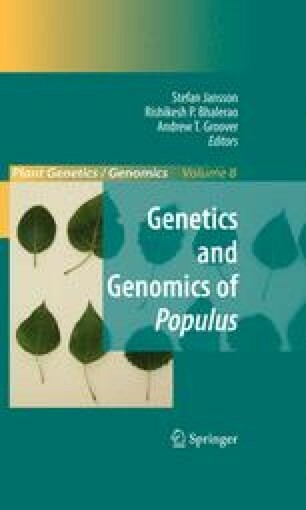 Substantial genetic variation has been demonstrated in growth, water use efficiency and several growth determinants suggesting promising perspectives toward Populus improvement programs.